Cruisers have several reasons to want to collect a large volume of notes on a topic, for example lessons learned about the boat or an archive of places visited. An easy way to gather this information in once place is a personal TiddlyWiki. Wiki content is searchable, interactive, and you can share it online with fellow boaters. It is axiomatic that boat and boat component manufacturers do not hire competent technical writers. This is not an opinion; I'm a professional technical writer, and I assure you this is Fact (tm). At best, the content of manuals is illterate, incomplete, and barely applicable to the device on your boat. At worst, it looks as though it was xeroxed on a 40 year old Canon in a remote corner of Uzbeckistan. If you are anything like the crew of Don Quixote, you frequently find yourself supplementing – or well nigh replacing – the content of these manuals with your own notes and instructions on use, maintenance and repair of every part and component of your vessel. Collecting this information in any paper format is daunting. Moreover, the marine environment is not friendly to paper over the long haul. On your computer, your choices historically have been limited to spreadsheets, text files, and your own personally rolled database. Now, however, thanks to the great goodness of the open source movement, we have available to us a free utility called TiddlyWiki. You have probably heard of the granddaddy wiki of all: Wikipedia. If you haven't, just budget a few hours for Internet browsing and click that link. Wikis are interlocking, searchable, web pages which are essentially infinitly extendable and editable. Created by Jeremy Ruston, TiddlyWiki is one of several micro wikis out in the wild today designed for use in a smaller, more controlled world like your laptop. To use a personal wiki, you need a web browser (e.g. Firefox, Safari, Internet Explorer) and a copy of the TiddlyWiki template. Once you get the template saved to your computer, you won't need to be connected to the Internet to use it. So just load up the template in your browser, select File > Save Page As, and drop your new wiki on your hard drive. That's it. 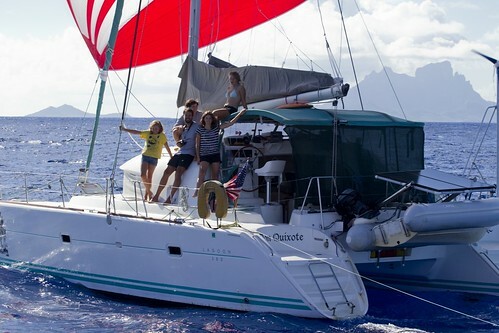 You are now free to start writing your technical manual for s/v . 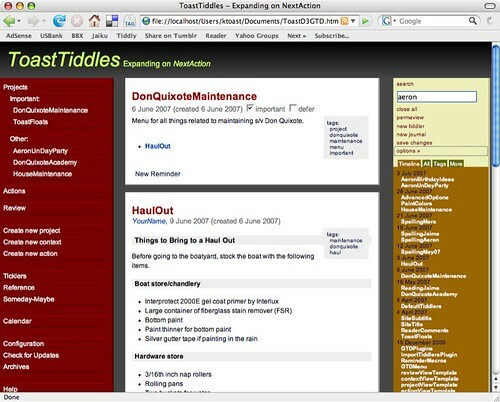 TiddlyWiki is a surprisingly powerful little tool. It includes a search engine, the ability to tag pages with the user name, and several options for backup. Each page you create is called a tiddler. A tiddler has a title, tags, and any text you choose to add. TiddlyWiki includes some limited formatting such as bold, italic, heading, and bullet. Tiddlers are automagically linked by any camel case phrased word. So you might, for example, have BoatMaintenence page with a list of items such as HaulOut, AnnualEngineWork, and WinterPrep. You can copy text from other sources such as PDFs or web pages into your wiki. You can also add links to web sites on the Internet. If you are connected to the Internet and you click one of these links from your TiddlyWiki, it will open up the page for you. This is a great way to build a tag list of sites for manufacturers of your boat's components, for example. And while you can't paste in pictures, you can paste in links to pictures which live either on the Internet or on your laptop and then click those links when you need to see the images. A final bonus feature: if you want to share your wiki with friends, family and fellow boaters, you can copy it to a web site and let folks know where it is. This takes some knowledge of how and where to post stuff on the Internet, which I'll take up as a tech tip another day. * Note to GTDers: I use a variation of TiddlyWiki known as GTDTiddlyWiki which is why you see the Project, Contexts, and Actions in the screenshots. It makes a nice compliment to iGTD or OmniFocus but I wouldn't recommend it as a primary application.